If you are looking to add a durable fencing system for commercial use to your property, Hohulin Fence is your answer. Our family-owned business has a track record of excellence, providing the highest level of satisfaction and service. Therefore, you can rest assured we have the commercial fencing Champaign IL businesses need. Making quality fences for more than 120 years, we are in a good position to help you buy with confidence. Did you know all our fences are made in the USA? 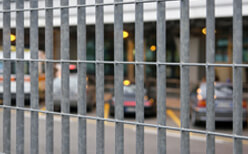 As a commercial business, it makes sense that you need a durable, secure fence to keep intruders out. On top of that, you also need to protect your inventory, customers and employees. Hohulin has provided businesses across the Midwest with superior commercial fencing, gate and railing products since 1897. Whatever you need to define your commercial space, Hohulin brings the experience and knowledge necessary to make it happen. When you need to rely on high-quality, custom-built products, rely on Hohulin. You will love our products and services designed to meet and exceed your needs. Chain link fences…vinyl fences…privacy fences…snow fences: we can accommodate all commercial spaces. The result? 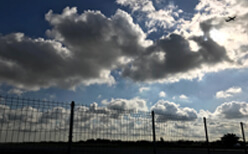 The optimal fence for safety, protection and beauty. Whether you’re looking to hide a dumpster from public view or protect your school’s baseball field viewing area, we can install the exact type of fencing that’s best for you. In conclusion, to inquire about our commercial fencing in Champaign IL, contact us at 217-655-9631. Alternatively, you can email us at info@hohulinfence.com. We are based at 116 South Harrison Street in Goodfield, IL.